TSP: Justin Taylor: "It's the Little Details That Make Fiction Seem Real." Justin Taylor: "It's the Little Details That Make Fiction Seem Real." 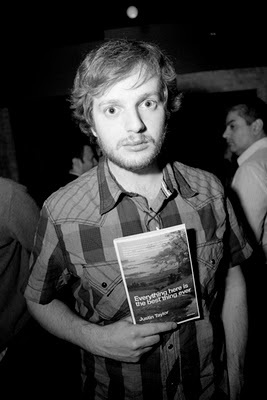 In the 18th in a series of posts on 2010 short story collections entered for The Story Prize, Justin Taylor, author of Everything Here Is the Best Thing Ever (Harper Perennial), talks process. I don’t think so—or, if I did, it was something that I basically considered a failure, i.e. not worth revisiting. But I am a fairly quick writer—typer, anyway—and so it’s not uncommon for me to produce a whole first draft in one sitting, then come back the next day or whenever and start sifting through it, fix the truly boneheaded errors, and start to figure out which parts of the draft actually interest me, and which need to be jettisoned ASAP. Some of the shorter stories in my collection, “Tetris” for example, came out more or less "right" the first time. Even in that case, I spent a lot of time worrying the prose up, but in terms of what actually happens, it was basically written as it now appears. That's a rare exception. I research on an as-needed basis, and usually in medias res. For example, in the story “Weekend Away,” Rose drives from her home in Portland, Ore., to Cannon Beach, which is on the coast. Along the way, she picks up a hitchhiker. Now, I’ve spent a good deal of time in Portland, and actually visited Cannon Beach, but I didn’t know much about the area in between. So first I mapped out Rose’s route on Google Maps as though I were driving there myself. Then I read some things about the Sunset Highway, which is the road I learned she’d be driving on. I figured out where she’d have to pick her hitcher up (outside Staleys Junction) based on the length of time that I wanted them to spend together in the car. A lot of what I learned about the Northwest coast never made it in, and I’m sure the good people of Oregon would have forgiven me if I’d just fudged, but I believe that it’s the little details that make fiction feel real—to the author as much as to the reader. Like the hitchhiker telling Rose that his mom has an antique store in Cannon Beach but that she actually lives in Tolovana Park. He doesn’t say that she lives there because it’s cheaper, but then, he wouldn’t have to—she'd figure as much. By the end of the story it’s not clear whether anything that the hitchhiker said was true, but if he did lie to Rose, they were convincing lies precisely because they realistically exploited her presumptions about him, which he would have been aware of when he told them. This is how effective fiction works—it makes you eager to be complicit in your own hoodwinking. Of course, this assumes that the hitchhiker really was lying; he could just as easily have been telling the truth. There’s one story in my collection—“Somewhere I Have Heard This Before”—that jumps about six years. You’re told in the first line that Stan, the main character, is eleven years old. A few pages later, Stan is seventeen, and this naturally means that a lot has changed for him (and the other characters) during the missing time. I was thinking of To the Lighthouse, and how Woolf sets aside a special chapter to cover two decades in the life of the Ramsay family and their summer house, and kills off a major character in a parenthetical aside. In a short story, of course, the main constraint is always space—all short stories fly economy class. My whole story runs less than 2,000 words, with the jump taking place about midway through. There's no section break; just a new paragraph which begins “When Stan was seventeen...”, as if the jump were as normal a detail as the color of a shirt or a door opening. You know when you’re having a very normal conversation with someone, and then they slip in something outrageous? And you’re going “uh huh, yeah, uh huh,” and then a beat or two later, after you’ve already said “yeah, uh huh” to the crazy thing, your brain actually registers what your ears heard and you say, “Whoa, hold on. What was that last thing you said?” I wanted this moment in the story to read like that feeling.